Come to our Chinese New Year Gala on Saturday, February 17th. There will be drinks, appetizers, and tickets are $25 a piece. All proceeds will fund the 2018 Danbury After-Prom Event! 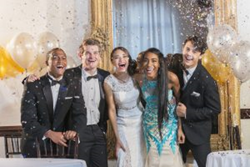 Kym Botson, founder and manager of the Botson Agencies in Fremont, Ohio, is leading a community charity event aimed at ensuring students attending Danbury High have access to a safe and fun prom event free from harmful activities. A Gala is planned for Saturday, February 17th to help generate funds for the event. “Come to our Chinese New Year Gala on Saturday, February 17th. There will be drinks, appetizers, and tickets are $25 a piece. All proceeds will fund the 2018 Danbury After-Prom Event!” said Botson. In addition to the Gala, the Botson team is planning on involving the Danbury community by initiating a referral system to guide donations. Each person referred into the Botson Agencies during this charity drive to receive a quote on insurance will produce a monetary donation to the event. All donations will be paid directly by the firm. More information on how to support the event, as well as a form that allows readers to suggest new charities for the Botson team to support in the future, can be found on this page: http://thebotsonagencies.com/rewards/. As a Personal Insurance Representative in Fremont, agency owner Kym Botson knows many local families. Her knowledge and understanding of the people in her community ensures that clients of the Botson Agencies are provided with an outstanding level of service. Kym and her team look forward to helping families protect the things that are most important – family, home, car and more. The Botson Agencies also offer clients a preparation strategy for achieving their financial goals. To contact an expert at Botson Agencies, visit http://thebotsonagencies.com/ or call (419) 355-1710 in Fremont or (419) 301-9193 in Catawba.